DQ*Plus was developed on the Java EE platform ensuring maximum scalability. 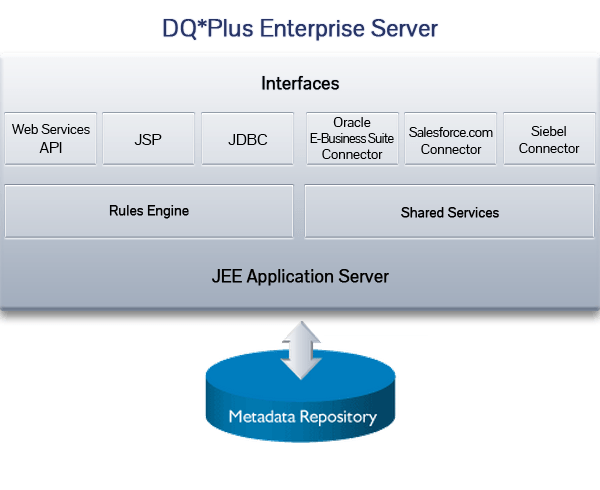 Application metadata is stored in the DQ*Plus database, transaction management and distributed computing are handled by the DQ*Plus application server and screens are presented in a browser through a zero footprint, JSP user interface. From its inception, DQ*Plus was designed to acheive the highest levels of performance to handle the most demanding enteprise requirements. For more detailed technical information call (925) 913-4593 or send email.